The above chart shows the annual variations in the operation of the business, from its origins as Roy Harrison and Associates to its change to MiScion Pty Ltd. The number of projects is the number of projects received and completed in a given calendar year. For each year there were a few more enquiries than actual projects pursued, but no formal recording of such carried out. Getting accurate date information into the project database has never been all that successful. in consequence as compromise was made and the database automatically assigns the date on which actions are carried out on the database. Whilst non-employing business, projects were entered into the database when required a project number to carry out the work, this could have been 1 month after first contact on a project or within 24 hours. Whilst an employing business projects were entered into the database within 1 week of confirmation as a project. As for completion and issue, dates in the database represent the date on which the project closed in the database, which could be within 1 week of actual issue: or when ceased being an employing business projects closed in the database at the end of the year. No issue date provided for early projects. As a consequence where no issue date given, these simply set to 28 days from date of issue. The curve for the of number of projects issued is therefore simply an offset of the projects received curve. The database is built using MS Access, and the curves are plotted in MS Excel. Tracking of expenses and invoices is managed using Quickbooks. The above curve is for calendar years not the Australian financial tax year. The annual revenues are given as a percentage of the maximum revenue for the period tracked. As the curves indicate the business is basically dead: which is not surprising as the entity has never really been a proper business. If the entity is not to be considered a hobby pursuing the interesting and challenging, it should otherwise have been considered and set up as a charitable foundation providing the engineering equivalent of legal aid. 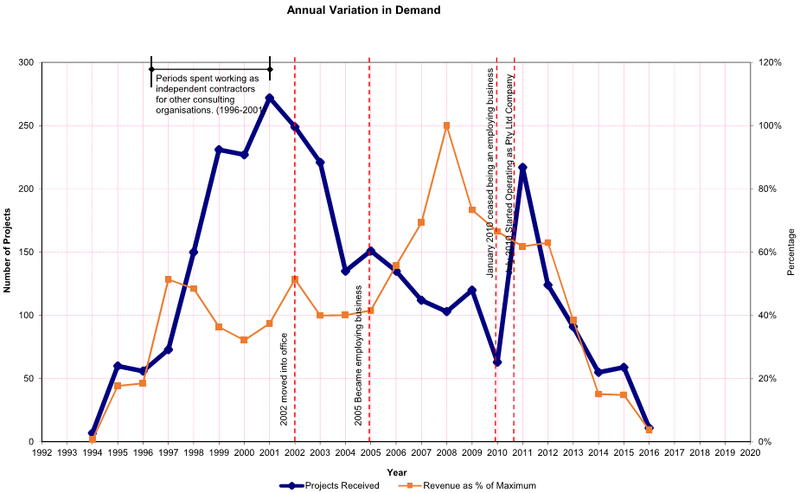 The peak project demand in 2001 was largely from 3 manufacturers of cold-formed steel sheds and canopies: the majority of the work being certificates of structural adequacy. Two of those businesses closed down, and the third only turns up when they need digging out of trouble. The downward trend after 2001 largely represented an increase in size of projects, moving from working for manufacturers to working with building designer and steel erector. Instead of producing standard calculations, moved to producing structural drawings and calculations for specific projects. After 2005 when became an employing business the projects also increased in size to include stormwater drainage design and workshop details. I only ever checked once in detail, but 80% of projects did account for some 20% of income. On average, after expenses, less than 60% of revenue available for distribution as wages to all persons concerned. Based on current federal minimum wage of approximately $34,985, then periods from 2007 to 2009, and 2011 to 2012 are the only periods during which funds were adequate for more than 2 people. Employees were paid according to Technical officers and draught persons award for South Australia at level C9. The peak revenue was in 2008 and the bulk of that came from 6 projects. The number of persons in total being 4: me, my dad, my nephew and a TAFE student in final year of Advanced Diploma. I am typically the one with zero wage, and live of the savings generated during the period 1996 to 2001 whilst working elsewhere on contract: my living expenses are thus relatively low. In 2005 became an employing business as there was a surge in demand for assessment of carports and verandahs, noted by 50 projects arriving in one week. From around 2001, the project list typically held around 80 on going projects. Projects were managed more on a priority queue. New projects could be completed in 48 hours of receipt whilst others put to the back off the queue. Project completion largely dependent on availability and completeness of the information required to complete the project. Most projects completed in 4 week to 12 weeks, a few projects took more than 18 months. About 5% of projects cancelled: the curves only show received and completed. Most people willing to stay in the waiting line if given pessimistic view of time in line: they are not happy when given optimistic time and it fails to eventuate. Most people seeking assistance with getting approval from DIY development application: the city council has typically given them 3 months (eg. approx 12 weeks) to respond with the requested additional information. Manufacturers typically waste the 3 months playing architect, then request the engineering in the last week. Not advisable to wait until the last week to get engineering: architectural and structural requirements have to be compatible, and the building surveyor granting approval is not a designer they are merely checking code compliance and since they have not been given the whole, they are checking in isolation. A lot of our time has been wasted by manufacturers and since we don’t sell time: our incomes have been relatively low. A lot of time also expended on assessing existing construction and doing whatever we can to avoid the need to demolish or avoid the need to dismantle to strengthen such structures. So whilst DIY construction is low cost to the owner builders, it has been a major expense to us. The typical approach to business is to drop the 80% of product that only contributes 20% of revenue. The problem with that approach however is it drops the 80% of the market which builds the reputation. The decline from 2011 represents more a loss of work than an increase in size of project. From around 2005 we moved into an office owned by our principal client: basically working on their projects to cover the cost of the rent. Not a good business move. Need to decide between large projects and small projects. Small projects are more numerous and more regular, whilst large projects tend to be intermittent. Small projects however have to be handled much like an hospital emergency room: everyone turns up and their project is urgent and they want the answer in a week or even in 48 hours. Dealing with the requests and getting the work done is a problem: a problem compounded by people who don’t pay attention to the time frame given and call up daily being a nuisance and deliberately applying pressure to push to the front of the queue. If don’t get rid of these people quickly, then no one else’s project is going to get completed. If choosing to serve the 80% then need to understand that they are not interested in engineering. The council may have sent them off to get engineering, but engineering is not what they need. My idealistic view is that engineering only takes place at the frontiers of science and technology. These projects are not at the frontiers of technology. The primary problem is a lack of prescriptive solutions. As mentioned elsewhere the design effort is not proportional to the size of the project but to the complexity. Though complexity does likely increase with size. As long as the structural form does not change then the calculation effort remains constant. Unfortunately for small structures the ratio between cost of calculations and cost of the materials is too high. For small structures it is important to design once and make many times. People have turned up actually expecting that we have calculations lying around on a shelf collecting dust. Or with an expectation that all we have to do is look at some drawings and simply issue a certificate. The lower price for a certificate of structural adequacy is because we do not expend time compiling calculations into a presentable report: calculations are still required and time is still required to carry out those calculations. However, the basic indication is that people expect a supermarket, with calculations and standard designs waiting on a shelf ready to buy. Small builders and owner-builders are capable of working out material costs, and even when materials are bought retail, the cost for small buildings is far less than can buy from a manufacturer. Unfortunately the DIY builder does not have the drawings and calculations required to get development approval: and the cost of design documents can exceed the cost of materials. Therefore to reduce costs to the DIY market, it is important to design and document once, then publish and sell the documents to many. Hence the potential to resurrect the business lies with providing the desired supermarket for published designs.